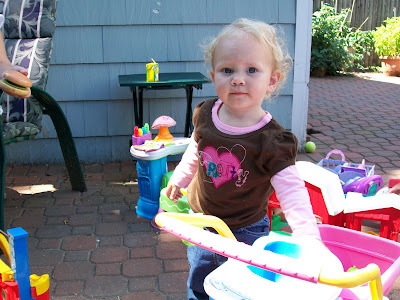 Here is a cute picture (Heather, you don't have this one) of Savannah doing a 2-fisted bagel dunk. It came out just a bit blurry, but you get the idea. A section of bagel in each hand, and the cream cheese in a handy spot. 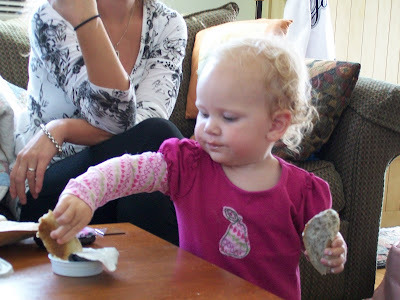 It amazes me that she would know to dunk the bagel in the cream cheese before eating it! Very impressive. Without too much elaboration, today is the day before I have my surgery. I won't go into details about it, but you are welcome to wish me well! I need to arrive at the hospital at 5:30am tomorrow morning. Like any 'activity' I undertake, I have over-prepared. (Buddy Joe would simply say 'obsess') I spent a small fortune this week at the grocery store, drug store, Big Lots, and Wal-mart, stocking up on anything I 'might' need. I have everything from latex free, powderless sanitary gloves to antibiotic ointment and ibuprophen and baby wipes and lint free cotton cloths and heaven knows what else. I have one more load of wash to do tonight, and I already have the clothes for tomorrow laid out. Today's 'twofers' are Heather and Miss Savannah. This was taken outside of the 'all you can eat' lobster place (Nordic Lodge) after we were stuffed and couldn't move anymore. Savannah is doing a 'hypno vulture stare' at a little girl, trying to psyche her out and take her into her power. That made me chuckle. Why do kids stare at each other like they are aliens? It's pretty funny. Charlie is off bow-hunting again this morning, and it is FORTY-SIX degrees out! Our first cool morning of the fall. For the last two days it has been gorgeous out, 70's and perfect, with that deep blue sky. Can't wait for the harvest moon coming up! Day 1317 - Lions and Spiders and Bears, Oh My! 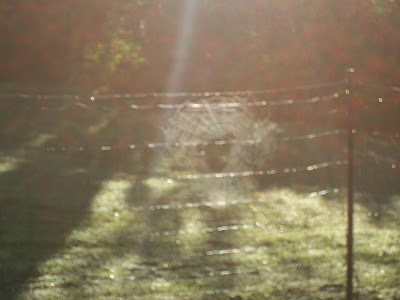 This is a picture of a HUGE spider web on our fence yesterday morning. It's probably a couple of feet across. Thank you, Charlie, for tramping outside yesterday morning in the wet grass to get that photo for the blog. Soooo... whassup? Did you have a nice weekend? We did - Papa Boudreaux's on Saturday with TY and SY, then yesterday we went to the health club and had the pool to ourselves in the morning, and watched the Titans (lose) in the afternoon. I made a huge lasagna pan full of meatloaf last night, enough for several meals, including last night's supper. The leftovers are already put away in the freezer. Gotta run! TTFN and have a nice Monday! Day 1316 - No rain in the forecast! For the first time in months (it seems), there is NO RAIN in the forecast for several days! Nancy - the Amazing Race starts tonight, don't forget to tape it! Here is Miss Savannah, gobbling banana yogurt. Some of it actually went 'down the hatch'. 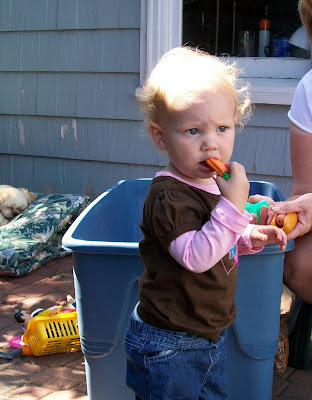 Come to think of it - Heather, have you bought those freeze dried baby yogurt bites? Clark loves those. Charlie and I are going to go swim this morning. (well, I need to change over the wash first) I went to water aerobics yesterday, and we all got kicked out of the pool after only half a class due to thunderstorms in the area. I didn't get much of a workout, obviously. Y'all have a nice Sunday and TTFN! Day 1315 - Ahhhh - the weekend! In addition to the weekend, it is also the first day of bow hunting season, and Charlie is out there somewhere in a blind. Hopefully he won't snore too loudly and scare them off! Today's photo is of Savannah 'hunting' seagulls, her little arm reaching out to try and touch one, even though it is quite some distance away! My agenda today while Charlie is hunting - water aerobics (2 classes), then shoppage. Hey! Congratulations to Mom and Gil for getting a new Honda CRV 4-door color SILVER! Good choice, Mom! Have a fun Saturday, everyone, and TTFN! TTFN, have a nice Friday and a great weekend! Day 1313 - Survivor Night again! However, it is Friday eve - isn't it? Survivor night, but I am going to go to water aerobics with GEORGE tonight, unless it storms. We are still having rain at some point every day, but I think it is going to clear up next week. I'm ready for that! Here's a cute photo of Savi with one of the 'Wiggles' characters, isn't that a cute face? I am running SOOOO late this morning that I can't blog for long. Have a nice Friday eve, and TTFN! Day 1312 - Happy Birthday, Christopher! Today is my nephew's birthday. Happy Birthday, Christopher! 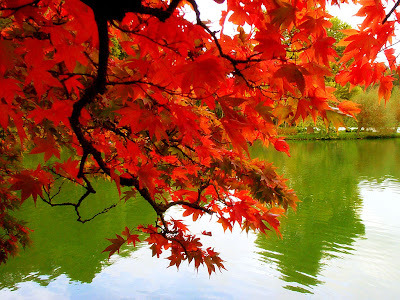 This is another beautiful fall scene - the colors are spectacular, and the reflection in the water is nice too! Today is our 9th consecutive day of rain. We only had 2 clear days before that, after more rain. Schools are closed in one county due to flooding. Yesterday the sun shone for a few minutes in the afternoon. Everyone acted like they'd never seen sunshine before - it was funny. After several years of drought, I'd rather have the rain, but people are finding it hard to mow their lawns! Yes, Charlie is still mowing here and will be through November. Temps during the day are 70's and 80's. I had a nice water aerobics class last night - but GEORGE, our hunky water aerobics instructor is leaving us - he is swapping water aerobics for cheerleading. (what a choice). He'll be there another week. Day 1311 - Happy Fall to All! 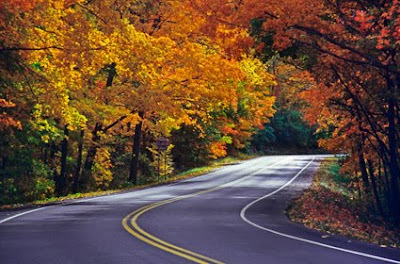 Greetings, Bloggy Fall Foliage Watchers! I pulled this photo off the internet, it's nice, isn't it? I have been on roads that look just like this. Today is the first day of Autumn, but it's raining here (again) for the 'nth' day in a row. I don't know anyone who doesn't love fall foliage - it is awesome! I haven't noticed any trees turning here yet, but the temperatures have been nice - not too hot. I am running a bit late and haven't brushed the tangles out of my hair yet - gotta go! 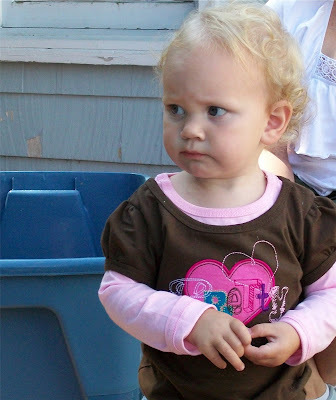 This picture of Savannah looks like an appropriate 'Monday face'. Kind of 'resolved' to go do something. Charlie and I went to the health club yesterday morning, and enjoyed the pool. The hot tub was closed, I'm not sure why. I was planning to do some shopping in the afternoon, but I ended up with a severe case of the lazies and stayed home instead. I did get some housework done and some bills paid, though! We watched the Titans game - did you? They lost, bummer. So - what's the good news? The good news is that tomorrow is Tuesday! I know - that sounded lame, didn't it? Yes, that's right - I never wrote a blog entry yesterday. Yesterday I went to two consecutive water aerobics classes in the morning, then we attended Charlie's grandson Clark's 1st birthday party in the afternoon. We had a great time. Here is an adorable photo of Savannah to highlight the day. Heather, I don't think you have this one yet. Day 1307 - What? Is it FRIDAY? What? Is it FRIDAY? Yes, Indeedy! It is! 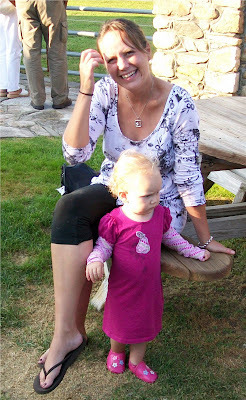 This photo was taken Labor Day weekend at Brenton Point State Park in Newport, RI. I had a very nice day yesterday, working from home. After work, I even had time to make a batch of oatmeal/pecan/raisin cookies. Charlie made chili for 'Survivor Night' - and it was delicious! While I was away, Charlie also made a batch of chili. He froze it in several containers for individual servings to have while I was on vacation. He'd had it a couple of times before he realized he had never put the chili seasoning in it! It was chili-less chili! Day 1306 - Hey! It's Survivorage Night! Greetings, Bloggy Survivor Season Openers! Hey - the 19th season of Survivor starts tonight, and it is in Samoa. Sorry, Nancy - I hope you set your VCR to tape it. I don't even remember seeing commercials to announce the season opener. Charlie was reading the paper and noticed it. Anyway - our usual 'Season Ritual' is that Charlie makes chili, and we have chili every Thursday night while watching Survivor. I'm working from home today, so I'm blogging in my bathrobe. Goodness, it's Wednesday already - how did that happen? 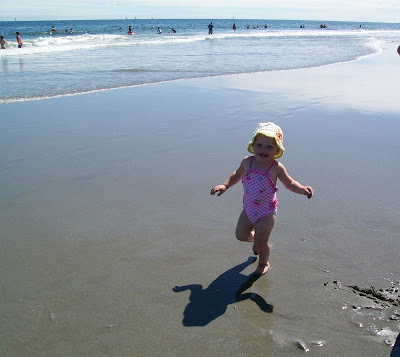 Here's a sweet photo of Savannah happily running down the beach. 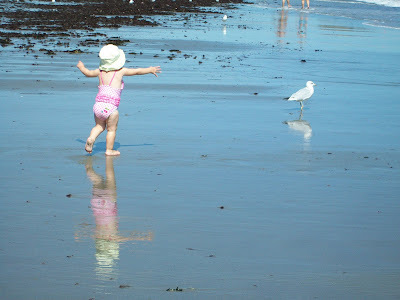 I haven't posted it yet, but I have a great photo of her chasing a seagull. It's nice that the beach isn't too crowded, and has lots of surface area for kids to play on! Hey - New Englanders - are the trees turning there yet? Gotta go! Have a nice Wednesday, everybody! 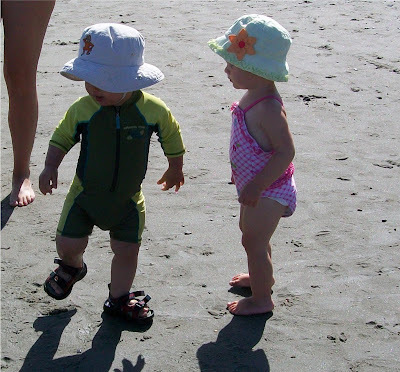 Today's Twofer is Savannah and her little beach friend, who is one month younger than she is. She is staring at him, wondering what he IS. 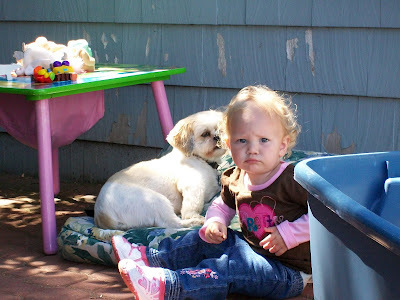 She didn't really make friends with him - she just stole his bucket to play with, and stared at him sometimes. Mom - Josh Turner was not on American Idol, but I do know who he is. He sings traditional country music and has a low voice. If anyone is interested, here is his bio. Cheryl left last night to return home. We did go to see 'Julie and Julia' yesterday afternoon, and enjoyed it. Charlie was THE token male in the theatre until nearly showtime, when a few men snuck in with their wives, hoping not to be seen. Changing subjects - did you ever see the movie 'Ghost Town' starring comedian Ricky Gervais? He's coming out with another movie soon, we saw a preview of it at the movie theatre. Gotta go! TTFN and have a nice Monday! 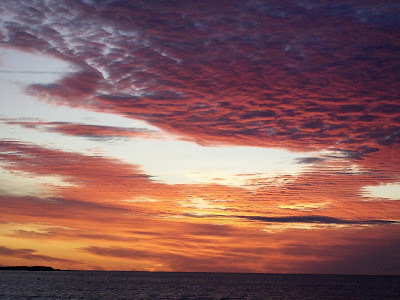 Here's another of my beauteous sunrise photos from Maine, Maine, Maine. Cheryl and I hit the health club yesterday morning, then went to Opry Mills Mall. We got to the mall at 10am, we left around 4pm! We saw 'Harry Potter' in the IMAX (Cheryl had never been to an IMAX movie! ), bought stuff, and had Starbucks coffee at the bookstore, walked all over, etc. What the heck is Bubble Tea? A tea-based beverage with little tapioca/gelatin bits in it. Gotta go! Today we're going back to the health club, then to see 'Julie and Julia'. 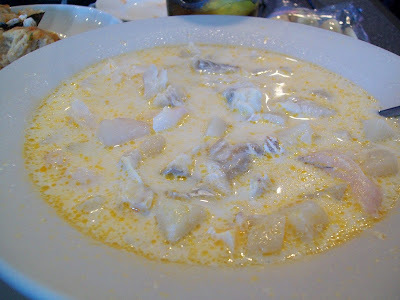 This photo is of the REAL haddock fish chowder at Huots restaurant in Camp Ellis, Maine. If you recall, it looks VERY similar to the photo I posted during my vacation! Cheryl and I had a great day yesterday, visiting, running errands, going to the mall, and watching the movie 'Ghost Town' (which is actually a romantic comedy) last night. We're leaving shortly to go to water aerobics at the health club. Yes, we're going to EXERCISE after eating a lot of CHOCOLATE yesterday. Gotta run, but have a great Saturday! I will be leaving for the airport this morning instead of work. Auntie Cheryl is en route and arrives a little after 8am. Her room is ready, the guest bath is ready, and the house is somewhat tidy (meaning not very but I'm not stressing over it). 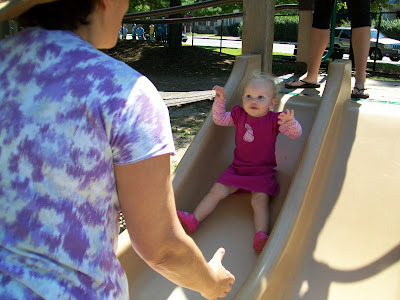 Here is Auntie C, catching Savannah as she slides down the slide at the park. Cute picture! We will have a fun weekend doing whatever we feel like doing. What we usually feel like doing is shopping, going to movies, and eating - hopefully including some things that aren't too terribly caloric. I haven't even BEEN to the grocery store since I got back from vacation, so the fridge is pretty bare. I can take care of that! Day 1299 - Thursday, but my Friday! I've been sending a lot of emails this morning and have NOOO time to blog. Here's a cute photo of Savi - chat amongst yourselves in the comments instead of reading my ramblings. 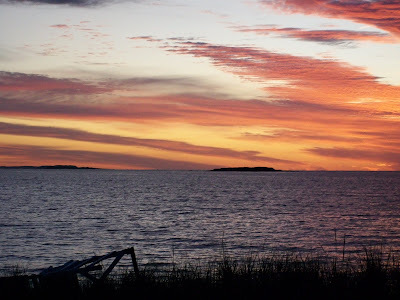 Here is one of my photos from vacation - a beautiful sunrise on the ocean in Saco, Maine. The problem with sunrise pictures is choosing one - they are all beautiful and I took a bunch of them. I waded through a lot of email yesterday and some required online training I needed to complete for work. I think I have some meetings today, so I'd better spin up on what I've missed during vacation. It's Tuesday, but be forewarned, it'll feel like Monday, I promise. 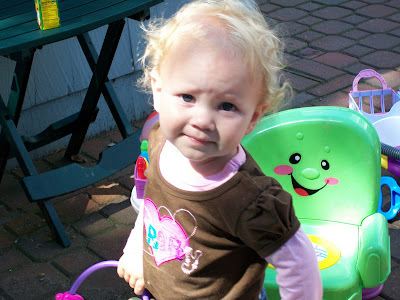 Isn't this a great, grumpy expression on little Savi's face? Actually, she made that face because she slid off the pillow on the ground and didn't enjoy that very much. Buddy Joe, Charlie and I had way too much pizza at the 'Mellow Mushroom' yesterday, THEN walked to Baskin Robbins for ice cream. I was so stuffed I took a Pepcid AC for insurance purposes before I even needed one. Have a nice 'Back to work' day, and be happy there will be a short week this week! Day 1296 - Happy Labor-less Day! One more day of vacation, then it's back to work tomorrow. 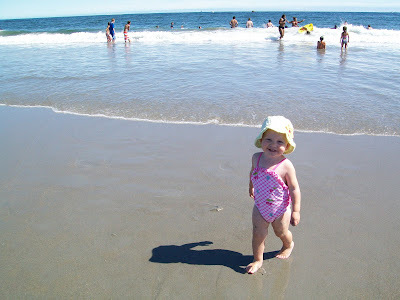 Here's a cute photo of Miss Savi at the beach, grinning at me. Too adorable for words, folks! I was away 10 days, and took over SEVEN HUNDRED photos, so I should have a good supply for the blog for awhile! TTFN and have a nice holiday! I forgot to say Happy Birthday to my nephew Will yesterday - Happy Birthday, Will! 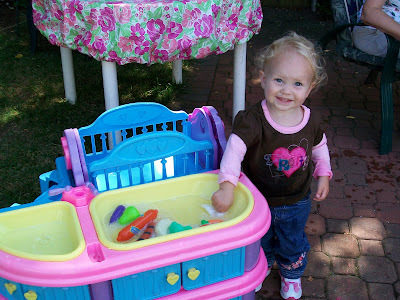 Today Savannah is 18 months old, she really looks and acts like a preschooler rather than a baby! If memory serves I had two whole lobsters, plus two lobster claws that one person in our group didn't want, two big alaskan king crab claws, 1 baked stuffed shrimp, 1 peel and eat shrimp, 2 crab cakes, prime rib with au jus, garlic bread, rice pilaf, pudding with raspberries on top, 1 chocolate covered cherry, 1 chocolate covered strawberry, 2 godiva chocolate cups filled with chocolate mousse, 2 mini eclairs, and a magic bar. Was that all??? Yes, that's all! Have a nice Sunday while I recover from yesterday's feast! Charlie is picking me up at the airport! TTFN! Family - thanks for everything this weekend! Love you! Day 1294 - Nordic Lodge Day! 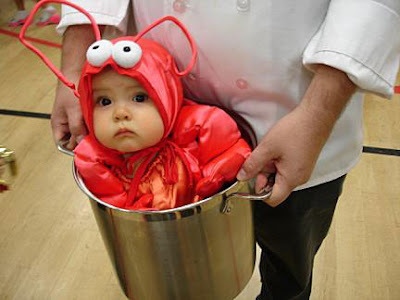 No, this photo isn't Savi, but adorable and lobstery! It's Saturday, and that means today is the day we are going to our annual seafood feast at the Nordic Lodge! See www.nordiclodge.com for all the info. We had an awesome day at the beach yesterday, and I didn't get burned. Savannah was hilarious! 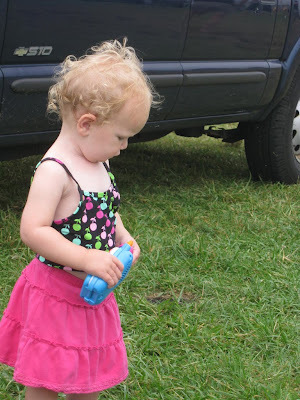 She enjoyed running in circles chasing us, then chasing seagulls, playing in the sand, digging in the sand, squealing at the cold water, and using both her bucket and a bucket she 'borrowed' from another little boy her age to play. We then went for ice cream at 'Moo-Moos' (great name!) and Savannah made us all laugh by snuggling up to a teenaged girl in line and kissing her on the leg, thinking she was one of our group. Looking forward to our lobsterage today! TTFN! Day 1293 - Friday, already?? Oh no! For once, I'm not necessarily delighted that it's Friday, because that means my vacation is almost over! Boo Hoo! But I'm not going to dwell on that, because today is beach day! 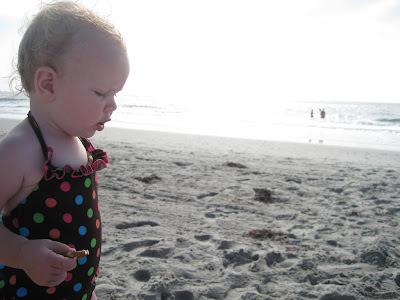 That's why I chose this photo of Savi at the beach. I'm not sure which beach we'll be going to, but Heather will take us there this afternoon and I know we'll have a great time. I had a perfect day yesterday with my son. We drove to Newport, walked around, had a Dels frozen lemonade, and shopped. Then we drove around ocean drive where the state park is, then around the mansions and down past First Beach. Then went out for a late lunch/early dinner at Perellas restaurant in Warren. Then we stopped at Newport Creamery for 'Awful Awfuls', which are AWFUL big and AWFUL good ice cream shakes. I had littleneck clams in garlic and oil (and I am not kidding about the garlic), and thin slices of eggplant and proscuitto rolled around ricotta stuffing and baked in the oven with marinara sauce - incredible is a good word for it. My son had various kinds of seafood (clams, shrimp, scallops)over pasta, also in white clam sauce. Speaking of FOOD, tomorrow is our seafood feast at the Nordic Lodge - the last hurrah before leaving on Sunday! Somebody remind me to print my boarding pass tomorrow morning! Day 1292 - Anniversary fishes, I mean wishes! This is what Charlie is busy doing while I'm on vacation, I think he's been fishing at least 3 times. 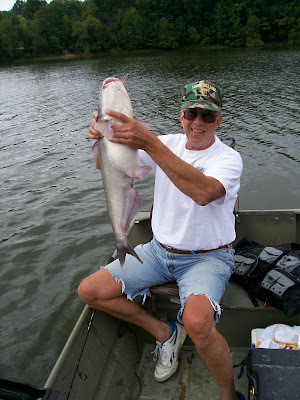 This MONSTER is an 11lb channel catfish, 29 inches long. That's bigger than most babies! 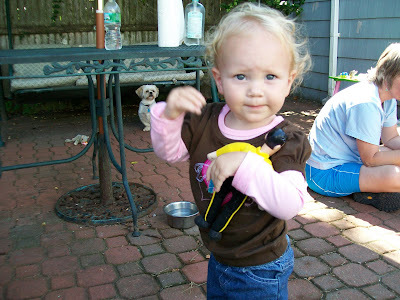 Back to Rhode Island - we had a great time with the family today, and Miss Savi was the star in many photos. Of course we all ate too much, but that's the way it is, isn't it? The magic wand I bought Savannah was a big hit, and she already knows how to operate it to make it sparkle and play music. Today I'm off to Newport with my son Evan, and we'll enjoy another nice day! Happy Anniversary to Mom and Gil today! Did you hear about the plane landing on Rt 495 in Mansfield, MA yesterday? We had to take an alternate route to Providence due to a PLANE ON THE HIGHWAY! I think that's hilarious, and am grateful no one was hurt. 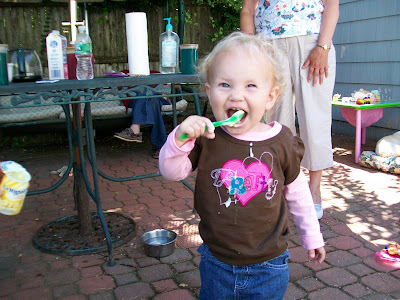 We're going to have a fun day today with the family, and I'll get to see Miss Savannah TWICE! We'll see her at lunchtime, going to visit at her other grandmother's house, then see her again at suppertime for a cookout. Yet another sister is also coming to visit, and other family members and friends. Day 1290 - It's September! It is a CRISP and INVIGORATING (read that freezing) morning in Maine - THIRTY SIX DEGREES. If you don't think the people here are tough, you've never faced a frigid AUGUST here in Maine and thought 'Why are there so many people HERE with weather like this?'. Just kidding, the weather is beautiful if you love low humidity and COLD. I heard a lady say 'We were robbed of our summer this year', referring to the rainy and cold summer season in Maine. I think she was right. We went out for fried clams and lobster rolls for supper last night, and had to bundle up in fleece jackets because the Lost Gull has two types of seating - outdoors or screen porch! A woman who attends our annual retreat showed me a 'spring photo' of her husband, enjoying the Maine spring sunshine in a lounge chair outside. The scene around him showed leftover snow drifts and ice on the lake in the background! Too funny. Today we will travel to Providence and descend on my sister and brother in law's house. Yo, sis! Yo, Bro! We're planning to leave sometime before noon - we have to have breakfast at the place that serves popovers on Tuesday morning instead of toast. 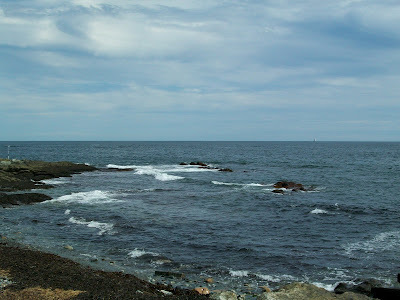 TTFN and onward to my next set of vacation adventures in Rhode Island!